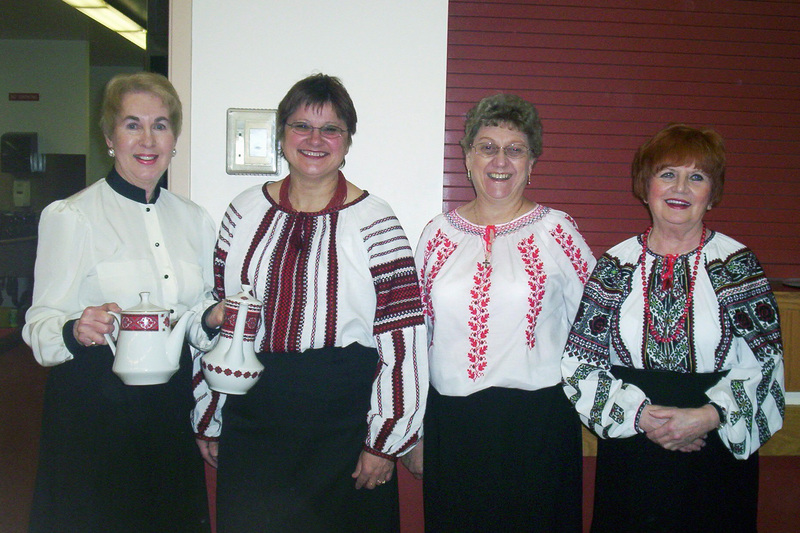 The Ukrainian Catholic Church throughout Alberta has embarked upon an exciting and courageous 25 Year Pastoral Plan, entitled Evangelization: A New Springtime. The Pastoral Plan challenges us to deepen our personal relationship with Christ and to grow in the life of God, in faith, and in spiritual understanding. The Pastoral Plan is a call to action in three areas or pillars: Word – to know God, Eucharist – to love God, and Service – to serve God. To learn more about the Pastoral Plan, pick up your copy at the entrance of your parish or visit our Eparchial website at www.edmontoneparchy.com. As we continue to implement our Pastoral Plan, the present document focuses on Service. Having come to know God and to love God better, we are called to follow God through personal witness and service. Let us focus here on one aspect of Service, namely, the action of building community through hospitality and a ministry of welcome. The word hospitality is derived from the Latin word hospes, which means guest. To be hospitable is to be welcoming and friendly to guests. In Greek, the word for hospitality is philoxenia (love for the stranger), which is derived from the word xenos, meaning stranger. Hospitality is not so much a task as it is a way of living life and sharing with others: being welcoming and friendly to guests, travellers, and foreigners. A home that lives and breathes hospitality is a home that is alive. In the ancient world and in the early Church, hospitality was taken very seriously. It was a public and sacred duty to welcome strangers and travellers, to offer them food, shelter and protection. The honour of the entire community was at stake. Hospitality was viewed as a pillar on which the moral structure of the world rested. Today, our understanding of hospitality has been reduced to the idea of inviting friends, family, parishioners or fellow-believers for dinner and fellowship, whether at home or in the parish hall. Our challenge is to go beyond the conventional understanding of hospitality and to re-discover the gift of hospitality as it was understood in ancient times and by the early Church. In our twenty-five year plan, our goal in the area of Service is to renew the spirit of hospitality among our families, in our parishes and in the Ukrainian Catholic Church as a whole. Hospitality will not just happen unless we give it deliberate attention. Already at his birth, Jesus knew what it was like to be turned away, rejected, unwanted. When it came time for Mary to deliver her child, she gave birth to a son, “laid him in a manger, because there was no place for them in the inn” (Luke 2:7). Imagine. No room in the inn for the Son of God. No wonder Jesus often preached on the theme of welcome. Let us reflect on some of the passages from the Bible that speak to us about welcoming the stranger in our midst. When a lawyer asked Jesus, “‘Teacher, which commandment in the law is the greatest?’ He said to him, ‘You shall love the Lord your God with all your heart, and with all your soul, and with all your mind.’ This is the greatest and first commandment. And a second is like it: ‘You shall love your neighbour as yourself.’ On these two commandments hang all the law and the prophets’” (Matthew 22:36-40; see also Luke 10:27). To offer hospitality is to love God, love self and love neighbour. “Then the righteous will answer him, ‘Lord, when was it that we saw you hungry and gave you food, or thirsty and gave you something to drink? And when was it that we saw you a stranger and welcomed you, or naked and gave you clothing? And when was it that we saw you sick or in prison and visited you?’ And the king will answer them, ‘Truly I tell you, just as you did it to one of the least of these who are members of my family, you did it to me’” (Matthew 25:31-40). To welcome the stranger in our midst is to welcome Christ himself. Jesus teaches his disciples that they must be the bearers of the same love of neighbour toward their enemies: “You have heard that it was said, ‘You shall love your neighbour and hate your enemy.’ But I say to you, love your enemies and pray for those who persecute you, so that you may be children of your Father in heaven; for he makes his sun rise on the evil and on the good, and sends rain on the righteous and on the unrighteous. “For if you love those who love you, what reward do you have? Do not even the tax-collectors do the same? And if you greet only your brothers and sisters, what more are you doing than others? Do not even the Gentiles do the same? Be perfect, therefore, as your heavenly Father is perfect” (Matthew 5:43-48). We are to welcome in our midst even those who are unkind towards us and with whom we have difficulty. In his letter to the Christian community in Rome, Saint Paul exhorts: “Let love be genuine; hate what is evil, hold fast to what is good; love one another with mutual affection; outdo one another in showing honour. Do not lag in zeal, be ardent in spirit, serve the Lord. Rejoice in hope, be patient in suffering, persevere in prayer. Contribute to the needs of the saints; extend hospitality to strangers” (Romans 12:9-13). And in the Epistle to the Hebrews, the author writes, “Let mutual love continue. Do not neglect to show hospitality to strangers, for by doing that some have entertained angels without knowing it” (Hebrews 13:1-2). The very thought of it. The strangers could be angels themselves sent by God to test our hospitality and generosity towards others! “Beloved, let us love one another, because love is from God; everyone who loves is born of God and knows God. Whoever does not love does not know God, for God is love. God’s love was revealed among us in this way: God sent his only Son into the world so that we might live through him. In this is love, not that we loved God but that he loved us and sent his Son to be the atoning sacrifice for our sins. Beloved, since God loved us so much, we also ought to love one another. No one has ever seen God; if we love one another, God lives in us, and his love is perfected in us” (1 John 4:7-12). The term people of God is found in the Old and New Testaments and refers to a covenant between God and humanity. God promises salvation and in return the people promise their obedience. God said, “I will live in them and walk among them, and I will be their God, and they shall be my people” (2 Corinthians 6:16). Pope Benedict XVI, in speaking of the Church as the people of God, said: “The Church, the people of God throughout the world, united in faith and love and empowered by the Spirit to bear witness to the risen Christ to the ends of the earth” (Farewell Ceremony, 23rd World Youth Day, Sydney, Australia, July 21, 2008). Membership of the people of God comes not by physical birth but by faith in Christ and baptism. To make my parish more welcoming, we must first be convinced that, as the people of God, we are called to welcome others into the Church, to introduce them one person at a time to Christ, and to walk with them on their journey of faith. This task is not the sole responsibility of the priest but belongs to all of us, lay women and men, religious, monastics and clergy alike. It’s up to me to make a difference in my parish as to how strangers are welcomed. Creating an effective hospitality committee. Create a Hospitality Committee within each parish consisting of parish members who are excited about the practice of hospitality within the parish and are committed to its renewal. Develop a training seminar to help them and others understand why welcoming visitors and strangers matters. But remind all parishioners that they have an important role in the ministry of welcome. Being welcoming of one another. Be more welcoming of one another within the existing parish community. It takes work and effort to create an internal welcoming spirit. The natural human tendency is to form cliques or circles of friends that are not always open or inviting to others. Every parish member must consciously take on the role of being a host, not a guest. The Greeter. Train greeters to welcome parishioners and guests to the church. Greeters are the people who stand faithfully at the doors to the church, hand out bulletins, and show people to their seats. When people come to church, it is important that they feel at home, part of the parish family. Greeters can make guests feel particularly at home. Paying attention to the stranger and guest. Pay attention to the stranger and the guest. Be aware of the tendency to greet the same people each and every Sunday. Be on the look out for new people coming to church, smile, and welcome them into the community. Make them feel at home when they have mustered enough courage to come to church, and further en-courage them and give them courage to come again. Challenge yourself to greet one new person each Sunday. Making the church available for prayer. Consider having the church open for prayer during the day at set times. An unlocked door is a personal invitation for people to enter and to pray. It is also a silent witness to the fact that this church, this parish, is open to all and invites everyone to enter into the presence of Christ and to encounter him in the silence of the church’s sacred space. 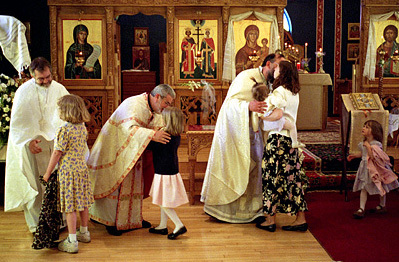 Restore the kiss of peace at the celebration of the Divine Liturgy. The kiss of peace is a traditional Christian greeting dating to early Christianity. The greeting with a kiss was also the custom practiced by Jesus. Such a kiss is mentioned five times in the New Testament: Romans 16:16, 1 Corinthians 16:20, 2 Corinthians 13:12, 1 Thessalonians 5:26, 1 Peter 5:14. “Greet one another with a holy kiss.” This is a sign of peace among the faithful, love in action, and a powerful gesture of welcome towards strangers and guests. Coffee hour after the Divine Liturgy. Personally invite newcomers to the parish centre for coffee, tea or juice and sweets after the Divine Liturgy. It is a wonderful sign of hospitality, makes them feel welcome and provides an opportunity to get to know each other better. And don’t forget to provide something special for the little ones. If at all possible, continue the coffee hour in the summer when those vacationing from out of town may be visiting the parish. The community table and fellowship. Another step is the community meal and social events. Parish communities, just like families, need to eat together to sustain their identity as a community. Not only is the table central to the practice of hospitality in the home but also in the church. The community table in the church hall and fellowship meals and gatherings are an important extension of the Lord’s Table and the festive celebration of the Divine Liturgy. Such gatherings provide opportunities to sustain existing relationships and build new ones. Individual parishioners may choose to sponsor the meal cost for newcomers and guests. Offering hospitality to visitors, travellers, immigrants, refugees and to the homeless. Another step in the renewal of hospitality is to be more friendly and welcoming to believers and nonbelievers, to travellers, strangers and immigrants, to be willing and ready to provide travellers and homeless with food, shelter and protection. Evaluate your parish as a welcoming place. Don’t be afraid to offer helpful suggestions to the pastor and others as to how your parish can become a more welcoming parish. Rate your parish’s level of hospitality by sharing ideas based on your own experience or from things you’ve seen and liked at another parish. For example, are the grounds tidy? Is there good signage as to Divine Liturgy times and how to contact the parish? Does the parish have a website? How are families with young children, the elderly, the disabled welcomed? Are welcome packs of information provided? Are newcomers contacted after their first visit to the church? Personal invitation. Personally invite someone new to the parish. A friend. A neighbour. A family member. Someone you know who used to attend church but for whatever reason doesn’t any more. The best invitation is a personal invitation. Remember, Jesus invited others to follow him, one person at a time. But don’t just invite them once. Extend your invitation over and over again. And once they start coming to church, continue to mentor them, show them around, introduce them to others, share your faith journey with them, teach them, explain things to them, invite them for coffee. Make a commitment to journey with them for a full year. This is evangelization in action. Introduce them to your best friend, Jesus Christ. And watch him perform miracles in their lives. And you would have been part of it. Your parish membership will have doubled. Now put that on your resumé for when you meet the Lord face to face. The ministry of welcome belongs to all of us. Young. Old. Male. Female. Parishioner. Stranger. Guest. We are all members of the one body of Christ. He teaches, “For as in one body we have many members, and not all the members have the same function, so we, who are many, are one body in Christ, and individually we are members one of another. “We have gifts that differ according to the grace given to us: prophecy, in proportion to faith; ministry, in ministering; the teacher, in teaching; the exhorter, in exhortation; the giver, in generosity; the leader, in diligence; the compassionate, in cheerfulness” (Roman 12:4-8). Christ needs each of us to use our gifts to build up the Church, the Kingdom of God. Let us do our part in making our parishes more welcoming, in welcoming the stranger in our midst. And then let God use also the gifts of the newly welcomed to transform this world into a better place, a place where hope and love abound. Consider the following story by way of a personal reflection – alone or together with your family – in responding to the needs of strangers, showing them hospitality, making them welcome. WWJD? What Would Jesus Do? WWYD? What Would You Do? “Do not ignore him when he is naked. Do not pay him homage in the temple clad in silk, only then to neglect him outside where he is cold and ill-clad. He who said ‘This is my body’ is the same who said: ‘You saw me hungry and you gave me no food’, and ‘Whatever you did to the least of my brothers you did also to me’ … What good is it if the Eucharistic table is overloaded with golden chalices when you brother is dying of hunger. Start by satisfying his hunger and then with what is left you may adorn the altar as well. “Will you have a golden cup made but not give a cup of water? What use is it to adorn the altar with cloth of gold hangings and deny Christ a coat for his back! What would that profit you? Tell me: if you saw someone starving and refused to give him any food but instead spent your money on adorning the altar with gold, would he thank you? Would he not rather be outraged? Or if you saw someone in rags and stiff with cold and then did not give him clothing but set up golden columns in his honour, would he not say he was being made a fool of and insulted. Consider that Christ is that tramp who comes in need of a night’s lodging. You turn him away and then start laying rugs on the floor, draping the walls, hanging lamps on silver chains on the columns. Meanwhile the tramp is locked up in prison, and you never give him a glance. “Well, again, I am not condemning munificence in these matters. Make your house beautiful by all means but also look after the poor, or rather look after the poor first. No one was ever condemned for not adorning his house, but those who neglect the poor were threatened with hellfire for all eternity and a life of torment with devils. Adorn your house if you will, but do not forget your brother in distress. He is a temple of infinitely greater value” (Homily on the Gospel of Matthew). How have I viewed hospitality – as a task or a way of life? Have I welcomed a stranger at home, at church, or at work? Do I reach out to others in my parish community? How do I assist my parish community in outreach to strangers, visitors, immigrants, and strangers? Am I ready to provide travellers and the homeless with food, shelter, and protection? How can I make my parish community a more welcoming place?